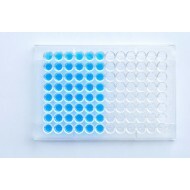 Chlamydia trachomatis IgG ELISA Kit 96 well ELISA microplate Incubation time: 1h 45 min Range: Cut-off Sensitivity: diagn. >95% Sample size: 10 µl Sample type: Serum, plasma Substrate: TMB 450nm ..
Chlamydia trachomatis IgM ELISA Kit 96 well ELISA microplate Incubation time: 1h 45 min Range: Cut-off Sensitivity: diagn. 83.3% Sample size: 10 µl Sample type: Serum, plasma Substrate: TMB 450nm ..
Chloramphenicol ELISA Kit 96 well ELISA microplate Incubation time: 60 min Range: 0.05 - 5 ng/mL Sensitivity: 0.03 ng/mL Sample size: 100 µl Sample type: Food, human urine Substrate: TMB 450nm ..
Chromogranin A ELISA serum and plasma kit 96 well ELISA microplate Incubation time: 2h 25 min Range: 50 - 1500 ng/ml Sensitivity: 10 ng/ml Sample size: 25µl plasma Sample type: Serum, plasma Substrate: TMB 450nm ..
Chromogranin A in saliva ELISA Kit 96 well ELISA microplate Incubation time: 2h 20 min Range: 0.14 - 33.3 pmol/ml Sensitivity: 0.05 pmol/ml Sample size: 25 µl Sample type: Saliva, urine, plasma Substrate: OPD 492nm ..
CIC C1q ELISA Kit 96 well ELISA microplate Incubation time: 1h 15 min Range: 1 - 64 µg/ml Sensitivity: 2 µg/ml Sample size: 10 µl Sample type: Serum Substrate: TMB 450nm ..
Coconut ELISA Kit 96 well ELISA microplate Incubation time: 60 min Range: 2 - 30 ppm Sensitivity: 0.4 ppm Sample size: 100 µl Sample type: Food Substrate: TMB 450nm ..
Corticosterone ELISA (Rat, Mouse) for serum and plasma kit 96 well ELISA microplate Incubation time: 2 h 30 min Range: 15 - 2250 ng/ml Sensitivity: 4.5 ng/ml Sample size: 10 µl Sample type: Serum, plasma Substrate: TMB 450nm ..
Human Cortisol ELISA Kit 96 well ELISA microplate Incubation time: 1 h 30 min Range: 10 - 800 ng/ml Sensitivity: 3.79 ng/ml Sample size: 10 µl Sample type: Serum, plasma (EDTA) Substrate: TMB 450nm ..
Cortisol ELISA Urine Kit 96 well ELISA microplate Incubation time: 1 h 15 min Range: 10 - 500 ng/ml Sensitivity: 2 ng/ml Sample size: 10 µl Sample type: urine Substrate: TMB 450nm ..
Cortisol free in saliva ELISA Kit (CE accredited) 96 well ELISA microplate Incubation time: 1h 30min Range: 0.1 - 30 ng/ml Sensitivity: 0.024 ng/ml Sample size: 50 µl Sample type: Saliva Substrate: TMB 450nm Further information Download the instructions for use ..
Crustaceans (tropomyosin) ELISA Kit 96 well ELISA microplate Incubation time: 60 min Range: 20 - 400 ppb Sensitivity: 0.09 ppb Sample size: 100 µl Sample type: Food Substrate: TMB 450nm ..
Cyfra 21-1 ELISA Kit 96 well ELISA microplate Incubation time: 1 h 15 min Range: 3 - 50 ng/ml Sensitivity: 0.15 ng/ml Sample size: 50 µl Sample type: serum, plasma Substrate: TMB 450nm ..
Cytomegalo Virus (CMV) IgG ELISA Kit 96 well ELISA microplate Incubation time: 1h 50 min Range: 1 - 90 U/ml Sensitivity: 1.15 U/ml Sample size: 5 µl Sample type: Serum, plasma Substrate: TMB 450nm ..
Cytomegalo Virus (CMV) IgM ELISA96 well ELISA microplate Kit Incubation time: 1h 50 min Range: 1 - 120 U/ml Sensitivity: 1.03 U/ml Sample size: 5 µl Sample type: Serum, plasma Substrate: TMB 450nm ..